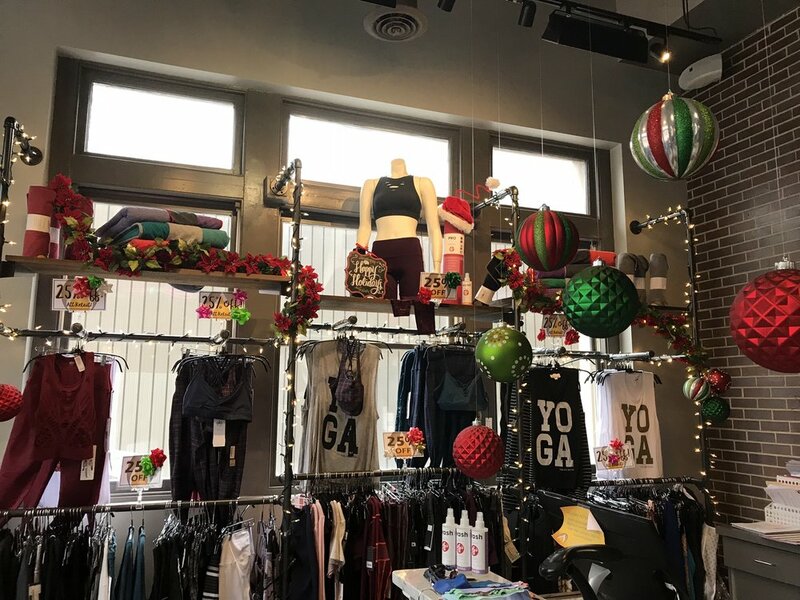 In my quest to step out of my comfort zone, I stepped into The Hot Room Indianapolis – Indy’s first studio to offer the Original Hot Yoga, Hot Power Vinyasa and Hot Pilates (and my first yoga classes). The idea of focusing on balance and stretching for an hour in a quiet and peaceful environment may appeal to some, but I’m used to noise, intensity and sweat – things I didn’t think I would find at a yoga class … until now! It was the Inferno Hot Pilates (HIIT + Pilates) class that may just turn me into a Yogi. Is that really a thing?! Imagine an hour-long class that pushes your limits with 20-second high intensity internal training exercises, then 10-seconds off. That’s right! 20-seconds to go all out and give it your all, followed by a 10-second rest. Legs, abs, arms – a full-body workout WITH fun, funky music jamming in the background. And the inferno part? It’s a powerfully heated class that makes you sweat like a – well, let’s just say it’s hot! Combine the exercises, music and heat with an incredibly entertaining instructor (Joel - Follow him on Instagram!) and I’m having more fun than I ever thought I would have in a yoga class! I’ve got a long way to go in terms of balancing, stretching and finding my inner peace but I am hooked on Hot Yoga! So what Is Hot Yoga? You might have heard the term Bikram Yoga when you hear hot yoga. The hot yoga trend began with Bikram Yoga, developed by Bikram Choudhury in the late 1960s and early 1970s. Largely due to the success and health benefits of Bikram Yoga, many yoga styles and fitness practices began adding heat and humidity to their practice environments. At present, "hot yoga" can refer to the 26-posture sequence taught by a Bikram method teacher, or yoga, yoga-inspired fitness or stretching done in a heated environment. Bikram is the 26 postures sequence selected and developed by Bikram Choudhury and practiced in a room at 105 °F (41 °C) with 40% humidity. The method was inspired by an injury that the founder endured during a weight lifting contest that had doctors saying he'd never walk again. Using yoga for physical therapy, he recovered in 6-months. And, the rest is history. The difficulty depends on your willingness and interest in trying the different poses – there’s no way I was going to be able to accomplish a supported headstand on my first try, but it was impressive to watch others. What is it?? The best thing since a slice of pie:) It's a mix of High Intensity Interval Training (20 secs on and 10 sec off) + Pilates Principals + 95+ temps. This one is a scorcher and one of our favs. This is recommended for beginners who are new to yoga and new to heat. A class that breaks down the techniques for you so you're not skipping a beat when you graduate to Vinyasa. A sweaty, succession of postures that include downward dog, chaturanga, tree pose and more. This is an steady flow of poses intended to keep you moving. Bring the sweat towel for this one. The best ending to a hard day/week or even a great way to restore your body from whatever you are putting down on it. I wouldn't normally tap into such a chill class but I was pretty impressed with this one. It was the last class of the Indy Fitness Festival and it couldn't have been more perfect. Heated temps are much lower for this class and you are stretching majority of the time. Really just relaxing and ironing out those kinks you have built up. This class would be excellent for runners or those that need a little de-stressor without the high intensity heat and moves. The class times we frequent are either the Noon hour Inferno/Hot Power Vinyasa, or Sat Inferno. We have tested out the Yin Yang on Sunday evening. Here's a list of instructors we've tested and highly recommend for any class. We added a little extra commentary if personality does it for you. By far the best when it comes to energy and entertainment. A singer who showcases his talents on the studio mic during class and not afraid to show his dancing chops when the right song calls for it. You feel right at home in his classes. Encouraging, grateful and just an overall pleasant and REAL human being. Welcomed us all with open arms and a bit of zen. A great reminder to help ease not only your body but your mind. She kept you in the moment and really made this class a relaxing setting. Super welcoming, motivating and a sense of humor to help. I took my first Original Hot Yoga class with David and it was sweaty! He encouraged you the whole way. A personal trainer/inferno extraordinaire. Her arms are enough inspo to keep you pushing through the intensity of Inferno.Follow heron Instagram! Cute as a button and packing a punch in the yoga space. She brings uniqueness, happy-vibes and an encouraging spirit to every class and person who walks through her doors. P.S. she also instructs and she makes you not want to give up on those planks! Everyone! If I can do it, anyone can. The different classes and different levels of intensity offer a variety. Beginners are suggested to start with the Original Hot Yoga class. All the above! Every class focuses on full body and the high temps add that burn element to the intensity level of the class. As little as you’re comfortable wearing – it’s HOT! I wore capri pants and a tank top, but some wore spandex and sports bras; some men wore shorts and no shirts. Sweats of any kind! Gurrrl you don't want that added heat baked in. Leave your shoes, socks and cell phones outside the studio. Yoga mat (or a large towel to avoid slipping) - They do rent mats if you forget, but that adds up. About ~$4/mat. Invest in your own if you plan to come back. It's worth it. Water bottle - I mean, this should be a given but they sell water for you if you forget. About ~$1. Show up early to class so you can get introduced to the studio, fill out a waiver and get your spot in class. They fill up super fast and there's only one studio room in the entire space. Show up at least 15 min early or you risk your spot in class being taken. Hydrate the night before and day of so you don't dehydrate in class. Slow down and take breaks when you need to. Safety first. You know your body better than anyone. Try an in-person tour in advance. Follow the instructor's lead. They know what they are doing. Come back for more! This workout, like most, doesn't get easier but you get stronger and learn to tolerate the heat and the intensity more with each workout. Stay consistent and you'll see results. The Downtown location is super nostalgic of old Indianapolis. It's located within an old fire station. Near the Lockerbie area and giving you all the feels of a big city studio. Quaint, with high ceilings and exposed brick walls throughout. One studio room. Enough to fit up to 60 people. Classes fill up and you might find people waiting outside the studio room to see if a spot frees up on the waitlist. You know you got a popular spot when that's happening. The Uptown location (the original) is still to be tested out but we will update this when we do! Located right in the studio, it's the best of the best in terms of equipment (mats, towels, water bottles) to tights, tops, sweatshirts, to even casual outerwear like jackets, dresses and jean shorts. Intro Month $39 for 30 days – First month of unlimited yoga. $99/month - unlimited post intro month. This gives you access to both locations, Uptown and Downtown. 10 Class Punch Card - $150. This makes sense if you're not able to make it consistently. This gives you the ability to flex in and out without having the stress of making it to class on a regular basis. Out of Towners Special - $49 for one week of unlimited yoga. Their downtown historical space, boutique, Inferno and Joel. Not to mention the results you get. And yes, after googling it, I now know what that means! Would You Try Hot Yoga? but I tend to get in a fitness rut. I tend to do what's easy when it comes to exercise, but this year I want to challenge myself. I want to step out of my comfort zone and step into new classes, new gyms and new fitness experiences. I want to sign up and train for a few endurance events that will push my limits. I want to be healthy and fit for myself, husband and kids. This is my year to get it done! Lose the weight! Gain muscle and definition! Lose the negativity and gain more confidence. I look forward to trying new things, while still enjoying my old favorites too. I know it will be a challenge, but I'm excited about where this will lead me. I hope you'll join me as I share these experiences with you - blogging about the new classes, gyms and experiences.